To use this feature, some preparation are needed. 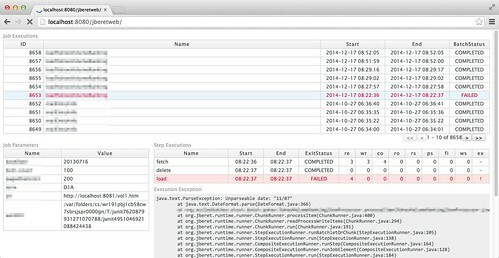 first, you have to expose a remote EJB interface of javax.batch.operations.JobOperator from your batch application archive. an example of simplest one is available here. also entire of the project is here. 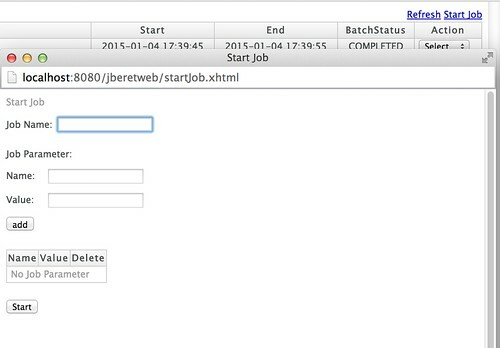 Then save first one of yours ("java:global/jbatchtest-1.0-SNAPSHOT/JobOperatorFacade!javax.batch.operations.JobOperator" for example), then put that string to a build parameter of jberetweb (after "-DjobOperator.jndi="). please refer "How to use" section of README.md for build instruction. Other operations such as restart, stop, abandon are implemented too so I will write more about it later. jberetweb can be obtained from GitHub.